A couple of weeks ago, Samsung started updating the Galaxy S8 and S8 Plus to Android Oreo. The firmware started rolling out in select regions. At first, the firmware rolled out through OTA updates and then the firmware also made it to the web. Galaxy S8 and Galaxy S8 Plus owners were eager enough to grab the firmware files and flash them using Odin. The moment users pressed the start button in Odin, the updated started and crashed in the end. As a result, the phone wasn’t getting updated to Android Oreo. The initial version of Android Oreo for the Galaxy S8 was also reported to have the random reboot issue. Users reported that their phone was getting rebooted on its own after a specific amount of time. After coming across all these issues, Samsung pulled back the update. It took the Android Oreo files off from its servers and halted the update for a few days. The update finally started rolling out again about 3 days ago. It turns out that the flashing issue was related to the compression method used by Samsung for the firmware files. Usually, Samsung uses the .tar.md5 or the .tar conversion for the firmware files. But with the Galaxy S8 and S8 Plus, Samsung used the .lz4 conversion method. The existing versions of Odin did not support the .lz4. There was a workaround that enabled the users to convert the files back to the compatible format. However, Samsung rolled out a new version of Odin that now supports new firmware files. Now that all the issues have fizzled out, you can flash the Android Oreo on your phone without having any of the previous issues. Android Oreo flashing will go flawlessly with the new version of Android. 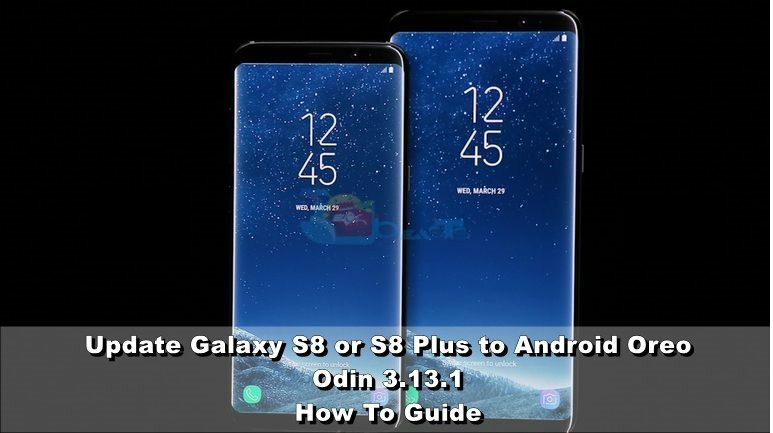 We did not post a guide to update the S8/S8+ Plus to Android Oreo because there were issues with the previous Odin and also with the previous firmware files. We decided to do a guide when all the issues get fixed. Now that everything is good again, we will take you through the tutorial to install Android Oreo on your Galaxy S8 or S8 Plus. Have a look at the following steps to update Galaxy S8/S8+ to Android Oreo with Odin. The guide makes the use of Odin 3.13.3 for this purpose. Follow the steps carefully to have the latest Android Oreo running on your S8 or S8+. This guide will work on all the models of the Galaxy S8 and S8 Plus. Do not try this guide on a phone other than Galaxy S8/S8+. Charge your phone up to 50% to make sure that it lasts through the flashing process. If the phone goes dead during new firmware installation, your phone can potentially get bricked. Backup all your important data including contacts, call logs, SMS messages and media content before the installation of a new firmware. If you have Samsung Kies installed on your computer, you need to disable it. If there is Samsung Smart Switch on your computer, you need to close it as well. Disable your Firewall or any Antivirus if you have installed one. Use OEM data cable to connect your S8/S8+ to the computer. Enable OEM Unlocking and USB Debugging on your phone. Get the latest Odin 3.13.1 and extract it on your computer’s desktop. Download the Android Oreo firmware for Galaxy S8 or the Galaxy S8 Plus. 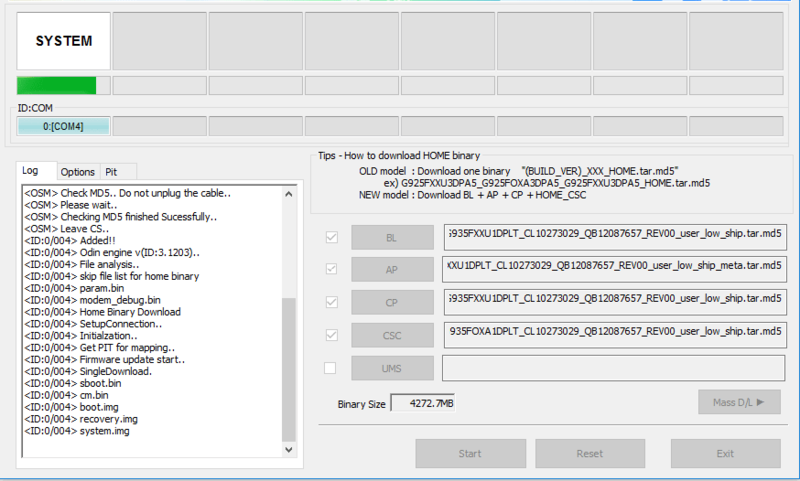 Extract the firmware on your computer’s desktop to get AP, BL, CP and Home_CSC files. Image attached for reference only. Open Odin3.exe file from the Odin 3.13.1 extracted content. Now put your Galaxy S8 or S8 Plus in download mode. To do so, turn off the phone first. Now turn on the phone while pressing Volume Down + Power + Bixby button simultaneously. Your phone will boot up in the download mode showing you a warning. Press the Volume Up key to continue. Connect your phone to your computer now. Now in Odin, click on the AP tab and load the AP file that you got from the firmware files. Similarly, click on the BL tab and select BL file. Select the CP file in the CP tab and select the Home_CSC file in the CSC tab. Navigate to Options in Odin and make sure that the only options ticked are Auto Reboot and F.Reset.Time. Now that you are all set to flash the Android Oreo on your S8/S8+, click the start button. Firmware installation will start now and come to an end within a few minutes. Your phone will reboot and you can disconnect it now. That’s all with the firmware installation on your Galaxy S8 handset.